Following my last post called Some News, I didn’t get any submission for the Double Critique: Landscapes. If any of my readers is interested in an honest critique, for landscapes or other, you can still contact me and I would be happy to help you. I will however shift the focus of the blog slightly. Instead of being just dedicated to Photography, I will now talk about Photography, Pets, Games and Stuff ie basically everything I like. To that effect I changed the template of the blog and will add little by little to the other categories. In Pets, you will find Red Pandas, Otters and other cutsies. In Games, you will find video games to sports related articles. In Stuff all the other things that are not photography, pets or games related. I hope you will enjoy it and give me your feedback through comments or the contact me page. Just in case people still visit this blog, I wanted to give some updates. Due to changes in the firewall I use during the week, I can’t access a lot of the sites I used to and when I can access I can’t leave likes comments. I extended the submission date for Landscapes and posted the results of Flowers. If I don’t get any submission by the 07/02, I will assume that people are not interested and I will stop it. If you have a picture you would like me to critique by mail feel free to send me the link to it and I will answer as soon as possible. I’m still trying to figure out my style but this time I’d like to take my time and not hurry things up. Hope you enjoy the start of summer. We asked you to submit the pictures of flowers you wanted us to critique, and 3 brave souls submitted us their work. In no particular order, please find their picture, with the critique below it. I love the light in this picture. It brings us to the vase and the main subject that is the main pink flower (sorry don’t know the name). The diagonals of the table and window help frame the subject. I have a minor issue with the line on the wall as it is slightly tilted. My biggest issue however is with a lot of things touching the border and being cropped. I tried to remove the branches touching but was not really pleased with the result. A strong decentered vignette might have helped. I think the contrast and tone chosen go well with the subject. Remus gave this information while submitting: “Photo taken with an old film camera, Praktica MTL 5 and with a film expired in 2003.” At this point I have to assume that the very soft focus was part of the work. I like the vibrant red of this rose and its position. I have some minor issues with some of the leaves, more especially the one on the left and the 3rd from the left that is tilted and break the pattern. I wonder if the part of the glass/vase adds anything here. My main issue is with the background pattern that is very distracting to me. I however still appreciate the mood created by this picture. I may be ignorant but I’m not sure I’ve seen a lot of pictures of flowers like this before. 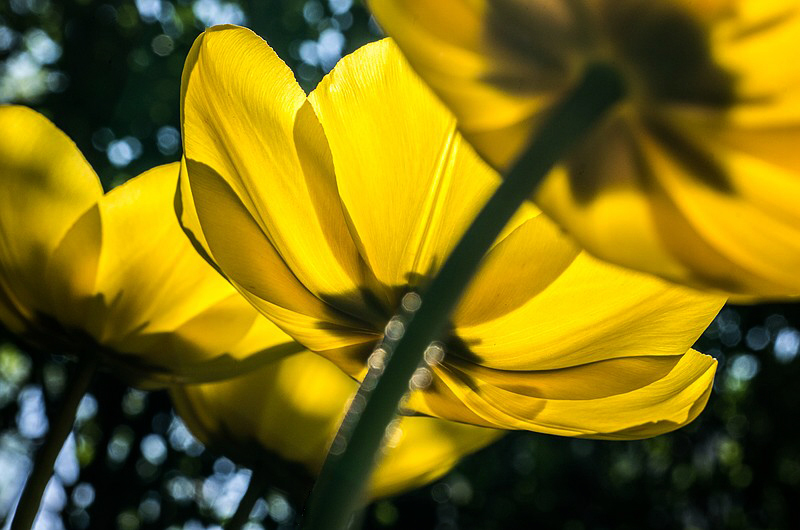 I really like the bright yellow opposed to the darker areas and the sun shining through and creating a nice bokeh. 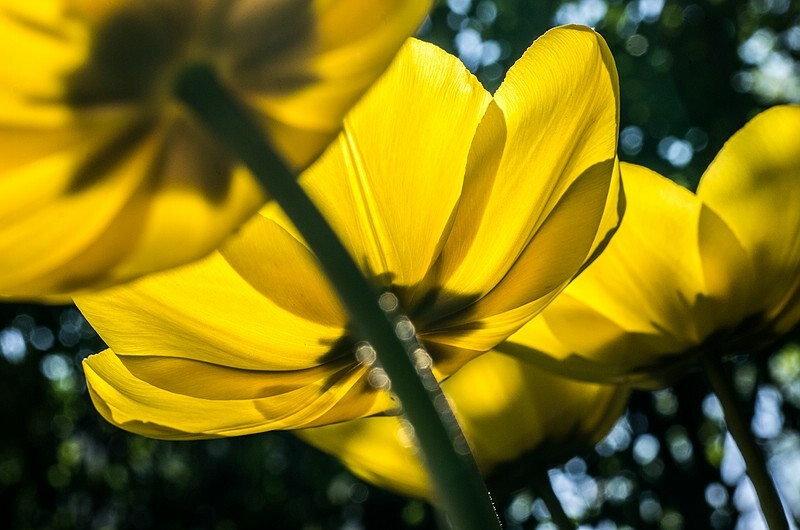 The issue with this angle is that the stems have a very important part in the picture and lets be honest, stems are not the most beautiful part of a flower. Maybe a slight move to the right at capture time would have given more petals and less stems. Eyes are caught by light and I believe that the small strip of light at the base of the first flower (in the center) is distracting. Also, reading from left to right, I believe I would have flipped horizontally. Below is my edit, let me know what you think. Thanks a lot to Autopict, Remus and Steve. I really appreciate your trust. I checked what picture I would have submitted and I think I would have gone with the one below as it is is one of my most recent and I find the flower very interesting. Feel free to tell us what you think of this critique by mail or in the comments. If you are interested in submitting the next theme is landscapes. Welcome to our online written photo critique! I wanted to thank all the people that sent us their pictures for the flowers theme. Critiques will be published on the 18th of June. Céline will critique here, depending on her availability. Beware of the change of mail address! June 11 – July 02: Email us a photo at least 600 pixel wide that matches the theme given, not matter when it was taken or edited. You can add a link to the photo online in your email, or a watermark on the photo ; if not, your photo will be posted anonymously. July 03 – July 08: The photos are judged and edited if we find it useful. July 09: The photos are posted in order of preference with a written critique and the best ones are featured on the main page. June 04 – June 10: Email us a photo at least 600 pixel wide that matches the theme given, not matter when it was taken or edited. You can add a link to the photo online in your email, or a watermark on the photo ; if not, your photo will be posted anonymously. June 11 – June 17: The photos are judged and edited if we find it useful. June 18 – June 24: The photos are posted in order of preference with a written critique and the best ones are featured on the main page, and go read Céline’s critiques on her website. 04 Juin – 10 Juin: Envoyez-nous par email une photo d’au moins 600 pixels de large, qui correspond au thème donné, peu importe quand elle a été prise ou éditée. Vous pouvez ajouter un lien vers la photo en ligne, ou un filigrane sur la photo ; sinon, la photo sera postée anonymement. 11 Juin – 17 Juin: Les photos sont jugées et éditées si nous trouvons que c’est utile. 18 Juin – 24 Juin: Les photos sont postées par ordre de préférence avec une critique écrite et les meilleures sont affichées sur la page d’accueil et allez lire les critiques de Céline sur son site. Interesting perspective: Loved this article on Light Stalking about Michael Paul Smith and his plays on perspectives. And to be slightly different this week, a picture that I really liked from Marsel Van Oosten, available on 500px. Have a nice week!